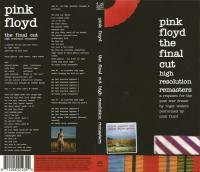 The Final Cut is the twelfth studio album by English rock band Pink Floyd, released on 21 March 1983 in the United Kingdom and on 2 April in the United States, through Harvest and Columbia Records. Initial recording for the album took place from 1978 to 1979, where outtakes from the group's previous record, The Wall (1979), were shelved and later used for the record. Additional recording took place throughout 1982 in several studios in Britain. The sessions were plagued by interpersonal conflict, and was the last album from the group to feature founding member Roger Waters, who departed the band in 1985, and the first to not feature keyboardist Richard Wright. Waters originally planned the album as a soundtrack for the 1982 film adaptation of The Wall, but with the onset of the Falklands War, he rewrote it as a concept album exploring what he considered the betrayal of his father, who died serving in the Second World War. Waters sings most of the lyrics, and lead guitarist David Gilmour provides lead vocals on one track. The record is somewhat viewed as a de facto solo album from Waters, as he is the only member to receive writing credits in the lining notes. It was accompanied by a short film released in the same year. The Final Cut received mixed reviews from critics, but was a commercial success, reaching number one in the UK and number six in the US. Retrospective reception towards the record has been more favorable, with praise directed towards its concept. Since its release, it has sold over 2 million copies. © 2011-2019 TorrentFunk. All Rights Reserved. 3 queries. 0.0118 sec to load.